In these photos I am wearing the costume. This was my first time ever giving sewing a try and I decided to start off putting together a costume so I could practice and the things I mess up wouldn't be a big deal since it is only a costume! 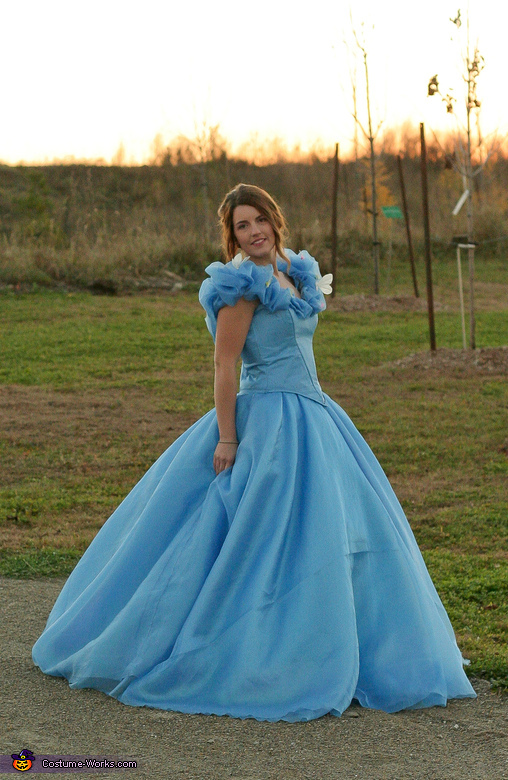 This costume was inspired by the 2015 live action Cinderella played by Lily James. But the whole background behind choosing Cinderella starts from when I was a little girl. Cinderella had always been my favourite princess. When I was young my family would watch the movie, read the picture book and act it out all at the same time. I was Cinderella, my dad the prince, my younger brother the two ugly stepsisters and my mom as the eveil stepmother. (For reference my mom is not evil and my brother is a great guy! haha). This costume took a lot more time and money than I ever anticipated. At first I started off trying to create my own bodice pattern but that was not going to happen, so I then turned to the Simplicity 1728D5 Pattern which I modified to match the movie's dress. I decided I wanted to make this dress as soon as I saw the movie in theatres which came out in March. In April I bought some material to start but didn't even own a sewing machine! So I had to wait until May when I was out of school and at my full time job working to save up some money to buy a used machine. Over the summer months I plucked away at the project but it wasn't until about two weeks before Halloween that I finally buckled down and worked almost every evening on the dress. And boy was that a lot of work! I was up until 12am every night putting it together, ripping out seams, and figuring out how to sew in zippers! But finally on the day of Halloween I was putting the finishing touches on. Like hand sewing the bertha collar and attaching the butterflies.